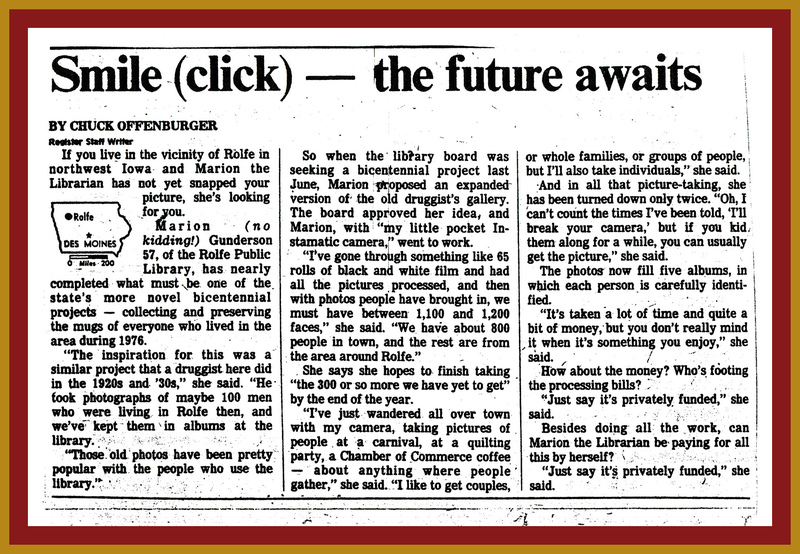 In the January 30 post I included an explanation about the Rolfe Public Library’s 1976 project where over 1,000 photos were taken of Rolfe-area residents. That project was featured in a 1976 Des Moines Register column by Chuck Offenburger. The AP wire picked up Chuck’s article. The result was … drum roll … national recognition for the little town of Rolfe’s photo project. Those articles, clippings and notes from around the United States are below and in the next two posts. They are so FUN to read! Click on any thumbnail below to enlarge it and to see the images in slide show view. To enlarge even more, hover the mouse over the image to see a “+” sign. When you see that plus sign, click on the image and it will magnify even further. July 12-14, 2013, Rolfe, Iowa, sesquicentennial. Today my oldest sister Clara posted on Facebook the following two entries. The flyer to which she refers may be downloaded here. 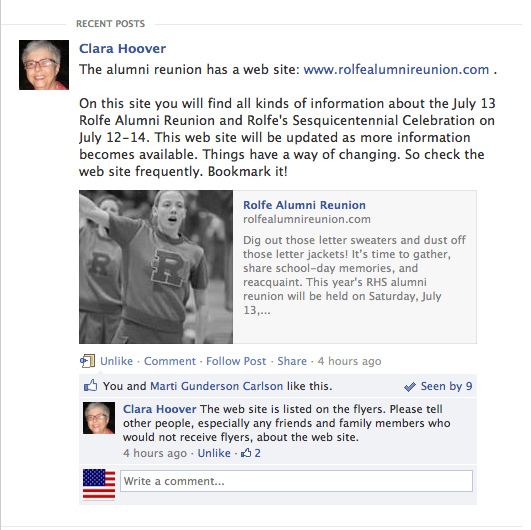 This next screen shot tells about the web site for the alumni reunion. Not only does the site present info about the reunion, it also includes dozens of links to information, photos and videos regarding this July’s sesquicentennial events, fundraisers (from which most anyone associated with Rolfe can benefit), and the town of Rolfe in general. I will be tending to the Barr Art Exhibit on early Saturday of the weekend. But … I want to be EVERYWHERE! It all sounds so much fun and interesting. Not just for people who have been around the block a few times, but literally for kids of all ages. Starting the Saturday with the 5K walk/run sounds sweet! I am especially looking forward to the Cemetery Walk taking place at noon on Sunday, July 14. The one-room school program at Streit Memorial Park on Sunday is also important to me; my dad attended that school (the one now at the park) in the 1920s when it was still in the country. Saturday night’s rodeo sounds like an action-packed evening with something for everyone, even for someone like me who doesn’t wear boots and hasn’t been to a rodeo in decades. On a side note about the rodeo, apparently the lights at the rodeo (formerly the football field) currently are not functional. The rodeo group’s fundraiser this year focuses on the lights, once again, becoming functional. Details are at the FAQ page of the reunion web site. Mention of those lights makes me think of crisp fall evenings. The cadence of the RHS marching band before the game and at half time. Someone from the crowd hollering, “Put Lumpy back in!” And, Harold Calligan announcing the game. 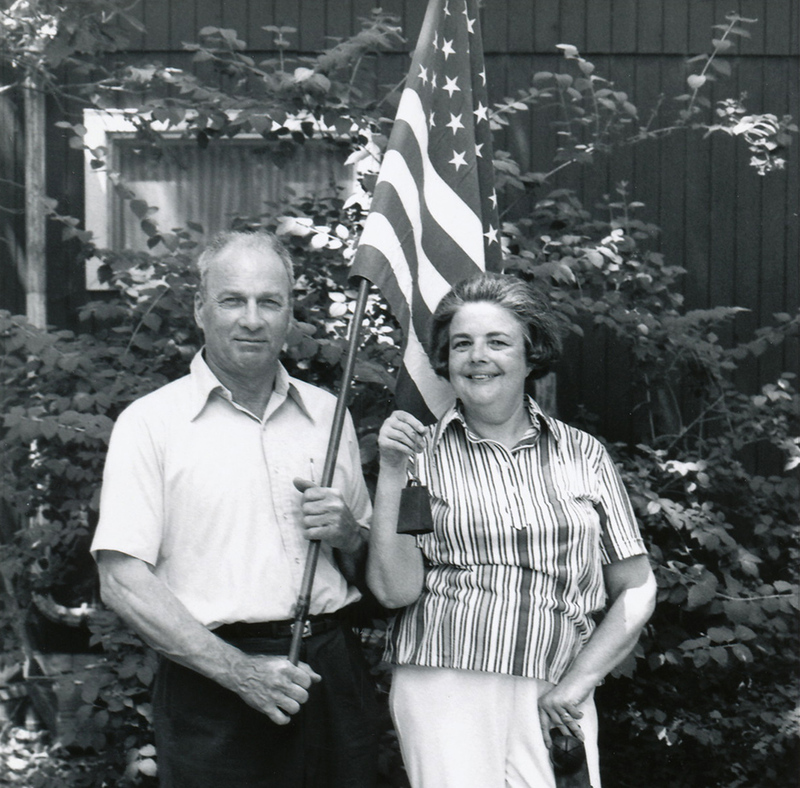 2) helping the VFW women raise funds for replacing worn flags at the cemetery. Both of these causes are addressed at the reunion web site. 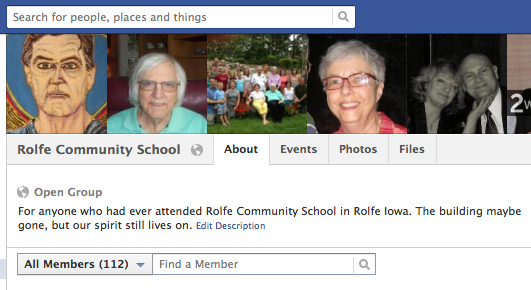 A little bit about the Rolfe Community School Facebook group is here in this next screen shot. As of today, the group has 112 members. *Of course, having prints of Mother’s watercolors available to help raise funds for the library is also very near and dear to my heart. SHORTER STORY: This blog post refers to photo albums from 1976 that are permanently located at the Rolfe Public Library. In those albums are photos of approximately 1,100 Rolfe-area residents who were photographed in 1976. If you don’t want to read the “Longer Story,” just click here to view the 1976 Des Moines Register article* that tells about the photo project and acclaimed national attention. And … check back to read how a variety of newspapers across the country reacted. More importantly, please stop by the library and look at these 1976 Rolfe albums. Also feel free to peruse similar albums of photos taken decades earlier by Rolfe’s Charles (Charlie) Webb. LONGER STORY: In 1976, during the bicentennial of our United States, Mother (Marion Gunderson) photographed** approximately 1,100 residents living in or near the community of Rolfe, Iowa. The article below speaks for itself. Except … what it does not indicate are two things I consider to be important. 2) This article (below) does not reflect the vastness of publicity the 1976 Rolfe project received from media around the nation. Over the next several days, I’ll include some of those newspaper clippings. You just HAVE to check back to see those clippings. They ooze of warm fuzzies re: Rolfe. What happened was this: The article (below) was put out on the AP teletype wire. It was then picked up by newspapers ranging from New York to California, Minnesota to Mississippi, and beyond. Not only that, it was picked up by radio and television stations, for example, a TV station in Tulsa, Oklahoma. *The article was written by Chuck Offenburger. Dan Offenburger, Chuck’s brother, taught and coached at Rolfe. **Some photos were contributed by other people. The Monday after the Super Bowl … a National Holiday? People who know me very well know I’m in favor of smaller government as opposed to bigger government. So, while I’m not all that excited about the government declaring more national holidays, I can’t help but be fascinated re: my nephew Josh Moore and his petition receiving so much publicity. Yesterday, January 24, Josh launched a petition at petitions.whitehouse.gov. The focus of the petition is for the Monday immediately following the Super Bowl to be declared a national holiday. One hundred thousand signatures are required for the petition to have a chance to receive official consideration by the administration. As of 6:20 PM today (one day after the petition was launched) there were 5,369 signatures. In the YouTube video below, Josh is interviewed via telephone by Shepard Smith. In addition to the video, I’d really like to post a bunch of photos from when Josh was a little boy! Like, when he, his brother, and Abby and Katie went to the field to pick Iowa sweet corn. (Priceless.) Or, when the four of them were in swim suits on the street curb eating Fruit Islands cereal. Or, when they were all out on the driveway making miniature pop machines out of boxes. Next to them was a great big (oven? refrigerator?) box. Josh had converted it to a huge Pepsi vending machine and wore it for his Halloween costume. Josh has always been a creative spark plug for getting things done. Knowing Josh, it is fun and interesting to watch as the number of signatures increases. On a side note, for anyone who is interested in children’s literature and a teachable moment, it seems to me that this petition could be paired in grades 4, 5, or 6 with Frindle by Andrew Clements. In separate previous posts I published the first, second, third and fourth, and fifth of seven segments of the Rolfe, Iowa, 1988 quasquicentennial parade. Below are the final two segments. All seven segments are about ten minutes in length. If the video seems jerky, start it and let it play through (with its jerkiness) while you do something else. Then click to run through the video again. Doing so usually works for me. To watch the 1988 parade clips in chronological order, start with Part I of this series. Also, video of Rolfe’s 1963 centennial parade is here. In separate previous posts I published the first, second, third and fourth of seven segments of the Rolfe, Iowa, 1988 quasquicentennial parade. Below is the fifth segment. All seven segments are about ten minutes in length. The remaining two segments will be posted over the next few days. In previous posts I published the first and second of seven segments of the Rolfe, Iowa, 1988 quasquicentennial parade. Below is the third segment, and also fourth segment. All seven segments are about ten minutes in length. The remaining three segments will be posted over the next few days. 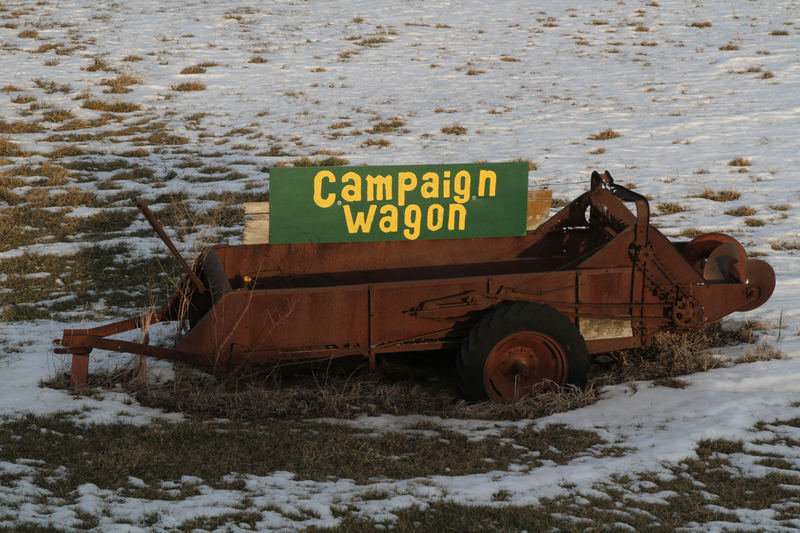 Update 1-21-13: Today the fifth segment of the parade video was posted. If any of video seems jerky, start it and let it play through (with its jerkiness) while you do something else. Then click to run through the video again. Doing so usually works for me. This summer the sesquicentennial — 150th “birthday” — of Rolfe, Iowa, will be celebrated*. In a previous post, I included a video of the parade and socializing from Rolfe’s centennial taking place in 1963. The video below is the first of seven clips from Rolfe’s 1988 125-year celebration … its quasquicentennial. Each of the seven clips is about ten minutes in length. The original footage isn’t crisp; this online version isn’t either. Still, I think it is priceless. Greg Lund, KCAU news anchor, was the announcer for the 1988 parade. DeAnn Cooper Sindergard assisted Greg with parade line-up details. Over the next few days I’ll post the additional six clips of the 1988 parade. Update 1-21-13: The second segment is posted here. The third and fourth segments are posted here. The fifth segment is posted here. Also, if any video seems jerky, start it and let it play through (with its jerkiness) while you do something else. Then click to run through the video again. Doing so usually works for me. *Rolfe’s sesquicentennial will take place July 12-14, 2013. 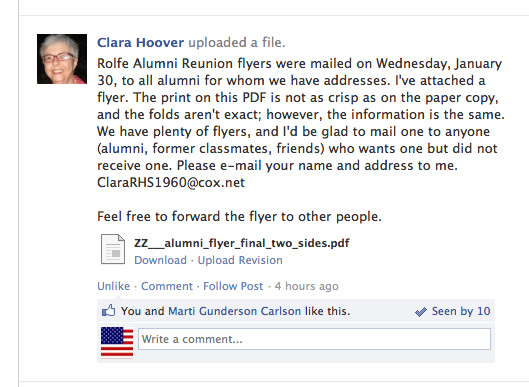 The Rolfe alumni reunion will be held on Saturday, July 13, 2013. Information about the alumni reunion will be mailed by the end of January 2013 (or, if delayed, by early February). The alumni reunion committee will also have a web site offering many details about the three-day weekend.